Every lead is singular, therefore understanding what messaging they will reply to, and what actions they are taking on your website makes lead nurturing easier. Although it might seem like a massive undertaking, it is a lot simpler when you are using your best small business CRM tool. Now if your organization has an impeccable sales enablement strategy, it is likely that you will most probably be already using a CRM tool, which can be used to warm up leads and therefore improve your company’s sales performance. 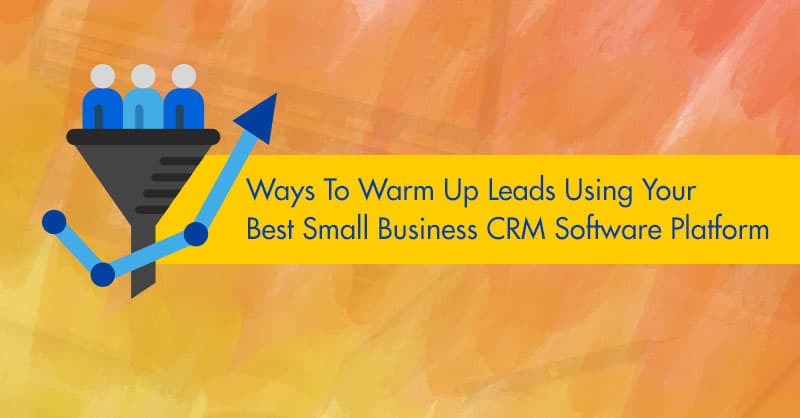 HOW YOU CAN USE YOUR CRM TO WARM UP LEADS? While it is true that you do not want to spam any of your potential leads, you should also keep communicating with them times and again so that they do not lose interest in your offering and look somewhere else. Using small business CRM software allows you to automate your email marketing campaigns and set up sales sequences to grab every lead that comes into the system. It is natural, following up on every lead, which needs warming up and nurturing would be practically impossible if your system is fetching more than 1000 leads a month. Nevertheless, using a CRM means you can enroll fresh leads into automated work, which takes the pain out of the lead nurturing process. You must also use your small business CRM to make certain that your attempts at re-engaging are not becoming annoying to your prospective leads. For example, if you are blasting a dozen emails in a day without any response, you will easily be able to see that information in your CRM software and then can adopt a different strategy to warm those non-responsive leads. If you are using a small business CRM such as ConvergeHub, it is a trouble-free process to define leads by where they are in your sales funnel, assign them as marketing qualified or sales qualified, and identify the buyer persona. Now, once you have demarcated your leads into different stages of your sales and marketing funnel, and you are aware that your lead is qualified, it is much easier to send them the required content useful to them at the stage they are in the pipeline. Modern small business CRM software platforms are capable of tracking clicks on landing pages, website visits, email opening rates, and content downloads, which provides a great insight into what actions your leads have taken previously and what contents can pique their interest. Therefore, once you are using a CRM, and you have this information on your fingertips, you can send relevant contents to your leads that they are more likely to respond. People feel more confident with people rather than with companies. Therefore, prospective leads are more likely to respond to information coming from an individual they have previously interacted, than to a generic email, such as ‘info@company.com’. Nobody wants to speak or respond to “info”, rather they want to speak to ‘Mike’ or ‘Gracie’, with whom they have interacted previously or have seen or read on the company’s website. Now you may think what does this have to do with best small business CRM. Well, when you are using a CRM platform, you can easily assign leads to sales reps of your choice, those who are thereafter termed owners of the leads, and so any communication going out from a lead-owner to the prospect is considered as a reliable information that is recognizable by the receiver of the communiqué. Since it is not advisable to warm up any leads if they are not opening their emails, using a CRM platform ensures that all leads are properly distributed, and all communications come from persons that your leads trust and recognize personally. Like a microwave meal, old customers those who are needed to be warmed up again are also as valuable as your new leads. Hence, if you are using your small business CRM efficiently, you can always have a list of previous customers you can retarget. All best small business CRM such as ConvergeHub are capable of taking note of any actions taken and communications done with old customers, and so your sales and marketing departments should be able to gauge the prospects past responses, and thereafter re-engage them with the appropriate messages. Follow these five steps and take the hassle out of lead nurturing by using your CRM for small business to its full potential. At ConvergeHub, we have a team of professionals skilled in lead nurturing and marketing automation to help you synergize your marketing and sales efforts. So why wait, go for a 14-Day free trial of ConvergeHub and let us help develop a lead nurturing strategy to supercharge your revenue.